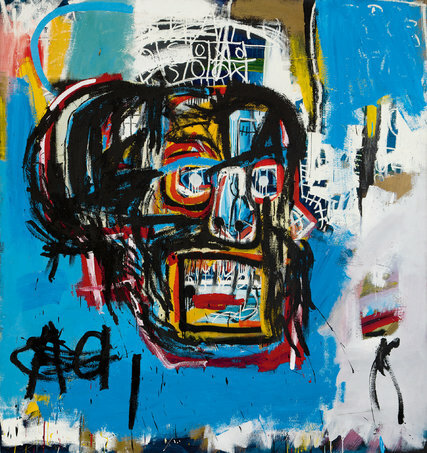 Jean-Michel Basquiat’s painting of a skull brought $110.5 million at auction in New York City last night at Sotheby’s. The auction house expected the painting to sell for $60 million. Since 1982, the year Basquiat created the painting, the Federal Reserve (via Paul Volcker, Alan Greenspan, Ben Bernanke and Janet Yellen) has used green ink to print and pump into the economy nearly $12 trillion. The money supply (M2) in 1982 was only $2 trillion. No way this bid would have been made without the help of the Fed money pump. The paintig was first bought at auction in 1984 for $19,000 by the late collectors Jerry and Emily Spiegel, according to The Telegraph. Zero Hedge notes: "It's sale 33 years later for over $110 million is equivalent to a total return of over 5,815x, or a compounded annualized return of some 30%, perhaps the single best unlevered investment of the past 3+ decades, and outperforming the return of even the most legendary hedge funds over the same period." Reminds me of the cannibal doll thst attacked Karen Black in Trilogy Of Horror. Which is not a good thing. The painting is hideous.